Stephan Pyles, a fifth-generation Texan, has opened 22 restaurants in 6 cities over the past 34 years, including Routh Street Café, which was named by D Magazine as one of the 35 biggest moments in modern Texas history. Chef Pyles is a multi-James Beard Award winner and has been named Chef of the year by Esquire Magazine. As founding father of Southwestern Cuisine, Pyles is recognized internationally as a pioneer of New American Cuisine. He is also a founding board member of Share Our Strength, a life board member of The North Texas Food Bank and co-founder of The Dallas Hunger Link. Accompanying him in the kitchen is executive chef, Mike Matis, who has over a decade of experience working in restaurants around the country. Book a seat and join fellow diners for a “True Texas” dining experience in the city, where Uptown and Downtown Dallas connect. Smoked duck confit/ Poblano / Oaxaca cheese/ sun dried tomato salsa. Yellow Rose Sazerac-Featuring Yellow Rose Rye, Absinthe, Peychaud’s Bitters, and Raw Simple. Sorrel / Pickled watermelon rind / Wildflower honey vin / Radishes / Candied beets. Prairie Fire-Featuring 1876 Texas Straight Bourbon, Lemon, Cranberry. Garnished with a torched rosemary and orange swath. Wagyu skirt steak / Charred spring onions / Corn puree / Arbol chile foam. Midnight Cowboy-Featuring Jacob Weldon Blended Bourbon Whiskey, Averna, Walnut Bitters. Garnished with an orange peel. Mole cake / peanut butter mousse / coconut milk ice cream / morrita powder. Garrison Brothers Stampede 66 Edition tasting. Garnished with a toasted orange peel and Luxardo cherry. 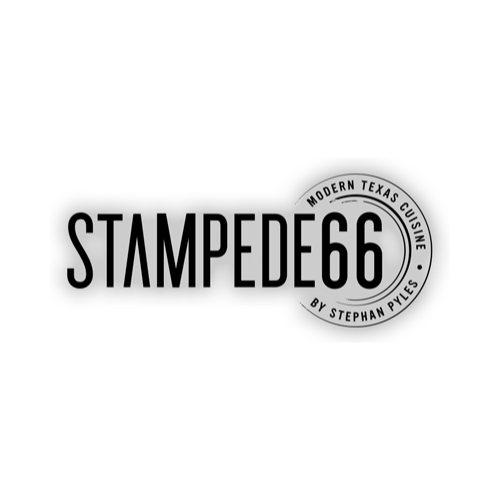 Stampede 66 celebrates Texas flavors with what Chef Pyles calls “modern Texas cuisine, with a twist.” It is Texas cuisine elevated and evolved, incorporating a fresh take on traditional Texan cooking. Pyles explains how the name of the restaurant is also deeply inspired by Texas culture, as well as cherished childhood memories: “The Stampede” is an iconic dance hall that was opened in 1954 in Big Spring, my home-town… The second half of the name, “66”, comes from my family’s restaurant that I practically grew up in, The Big Spring Phillips 66 Truck Stop Café. It was on the old Highway 80 that ran through every little town in West Texas.” If the food doesn’t win you over, the gracious Southern hospitality and stylish surroundings will, with interiors that epitomise Texas culture.